Resident Evil 2 has proved it is still relevant twenty years later by smashing this week’s Steam Top Ten. The 2019 reimagining of the 1998 classic takes pole position in this week’s chart. Capcom has already revealed Resident Evil 2 to be the best Steam launch in franchise history, and only slips behind Monster Hunter: World in being the publisher’s biggest PC release day success. 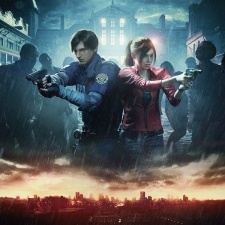 The writing was on the wall (painted in blood, probably) before the game’s release, as over 1.5 million players logged into Resident Evil 2’s limited-time demo. And while wrestling with the Steam Weekly Top Ten RSS feed didn’t reveal concrete answers, it looks like various editions or DLC packs may have scored the game a place at No.2 and 3. The Deluxe Edition of Resident Evil 2, meanwhile, settles for a respectable fifth place. With Monster Hunter: World returning to fourth, it may be that Capcom has stolen the show this week with 50 per cent of the entire Steam Top Ten. Breaking out of warp-space at No. 7 is spacefaring Warhammer strategy Battlefleet Gothic: Armada 2. The sequel to 2016’s adaptation launched last Thursday and boasts both a larger campaign and roster of interstellar armies. Rainbow Six: Siege takes two steps up in this week’s chart at No. 8. Jet planes and surreal war drama close out the Steam Top Ten, as Bandai Namco’s Ace Combat 7 intercepts No, 10.